This was made for a boys 18th birthday. His mother and father sent me pictures of him growing up, it was so fun looking through all the pictures. I thought it would be a fun idea to make it look like the cake is a photo reel. I printed out all the pictures on my edible printer and arranged them on the cake. His whole family loved the cake and all the pictures brought back so many memories. 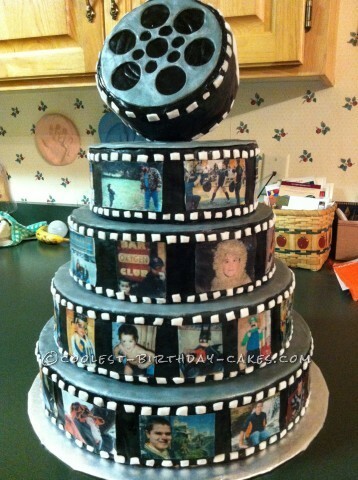 Birthday cake idea posted by Beth B.
I love this. The top is it a Styrofoam cake or is it a real cake? If so how did you get it to stay up?